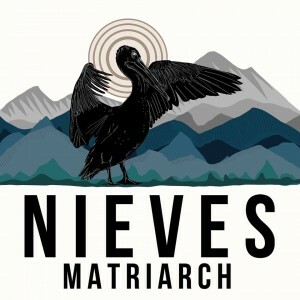 Glasgow four piece Nieves return with their second EP, Matriarch, which is their first as a foursome. Last year’s eponymous debut release only featured Brendan Dafters (vocals and guitars) and Herre de Leur (piano) but, for the last year, the band have been a four piece with the addition of Martin Murray on guitars and Ross Forsyth on drums. Describing themselves as influenced by the likes of The National and Frightened Rabbit, these influences are certainly displayed on this release, but there’s more than enough of Nieves themselves throughout to make this EP stand on its own feet. Opener The Knot sets the scene perfectly. Combining pop melodies with a glorious piano led backing, the track soars quite wonderfully, reminiscent of Frightened Rabbit in one of their better moods. The prominence of Dafters’ piano lends the track a real power and it’s a real statement of intent. Legs And Arms follows, again piano led but darker than The Knot with vocals laden with emotion, threatening to crack at every turn. Throughout the EP Dafter’s vocals are a real focal point, imbuing the music with a genuine sense of emotional depth. Empty Book is a fine example of this – you can almost feel his pain as he sings. We end on the excellent Black Tie which contains traces of The National circa Boxer with its angular guitar lines and foreboding drums. Matriarch really is a very striking release and one that certainly makes Nieves a hugely promising prospect. As their first release as a full band, it’s hugely impressive and definitely one to get your hands on. Nieves – Matriarch is available now on CD from the band’s Big Cartel store, and as a download via iTunes. The band headline King Tut’s on 18 December.